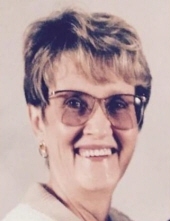 Patricia (Pat) Ruth Hopp, age 82 passed away peacefully at her home in Almont on March 19, 2019 with Hospice care. Pat was born on August 16, 1936 to Allen and Eva (Smale) Jones in Detroit. Pat married the late Lyle Hopp at St. John Lutheran Church on April 16, 1955. She worked as a secretary at Florida Atlantic University and was also a very successful 911 Dispatcher for Village of Romeo for 15 years. She enjoyed completing crossword puzzles, jigsaw puzzles, singing and collecting lighthouses. Patricia is survived by her children Mike (Diane) of Shelby Twp, Cindy (Rich) Gajewski of Almont, and Judy Lewis of Almont; grandchildren Matthew Bennett, Emily (Nick) Moore, Aaron Hopp, Brandy Lewis, James (Autumn) Gajewski, and Chris Gajewski ; great grandchildren Axton, Kolten, Rhys, Dylan, Sawyer, Ava, Nicholas, and Andrew; and her sisters in law Agnes, Eileen, and Jackie Hopp. Pat was preceded in death by her husband Lyle on March 18, 2009 and her son Joel on November 11, 2008. Siblings; John Henry Jones and Donald Jones and many nieces and nephews. Funeral services will take place on Monday, March 25, 2019 at 11 AM at the Henry M. Malburg Funeral Home of Romeo with Pastor Eric Majeski officiating. Visitation will occur Sunday, March 24, 2019 from 2 PM to 8 PM at the Henry M. Malburg Funeral Home. Burial will follow in the Mt. Avon Cemetery in Rochester, Michigan. To send flowers or a remembrance gift to the family of Patricia Ruth Hopp, please visit our Tribute Store. "Email Address" would like to share the life celebration of Patricia Ruth Hopp. Click on the "link" to go to share a favorite memory or leave a condolence message for the family.